Composable Nomination Classic Gold and Enamel Elegance Black Double Heart Charm, a stainless steel base link with 18ct Gold and enamel. Composable Nomination Classic Gold and Enamel Elegance Black Four Leaf Clover Charm, a stainless steel base link with 18ct Gold and enamel. Composable Nomination Classic Gold and Enamel Elegance Black Grill Charm, a stainless steel base link with 18ct Gold and enamel. Composable Nomination Classic Gold and Enamel Elegance Black Heart with Screws Charm, a stainless steel base link with 18ct Gold and enamel. 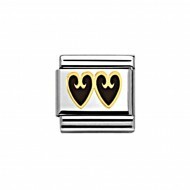 Composable Nomination Classic Gold and Enamel Elegance Black Hearts Charm, a stainless steel base link with 18ct Gold and enamel. 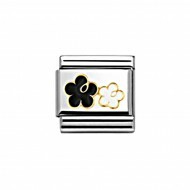 Composable Nomination Classic Gold and Enamel Elegance Flower Black Charm, a stainless steel base link with 18ct Gold and enamel. Composable Nomination Classic Gold and Enamel Elegance Flower White Charm, a stainless steel base link with 18ct Gold and enamel. 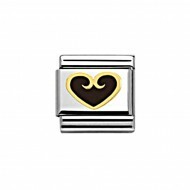 Composable Nomination Classic Gold and Enamel Elegance Heart Black Charm, a stainless steel base link with 18ct Gold and enamel. Composable Nomination Classic Gold and Enamel Elegance Heart White Charm, a stainless steel base link with 18ct Gold and enamel. Composable Nomination Classic Gold and Enamel Elegance Hearts Black Charm, a stainless steel base link with 18ct Gold and enamel. Composable Nomination Classic Gold and Enamel Elegance Hearts White Charm, a stainless steel base link with 18ct Gold and enamel. 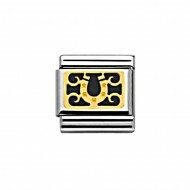 Composable Nomination Classic Gold and Enamel Elegance Horseshoe Black Charm, a stainless steel base link with 18ct Gold and enamel. Composable Nomination Classic Gold and Enamel Elegance Horseshoe White Charm, a stainless steel base link with 18ct Gold and enamel. Composable Nomination Classic Gold and Enamel Elegance Infinite Black Heart Charm, a stainless steel base link with 18ct Gold and enamel. Composable Nomination Classic Gold and Enamel Elegance Red Heart with Screws Charm, a stainless steel base link with 18ct Gold and enamel. 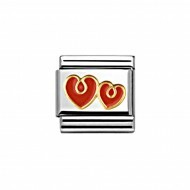 Composable Nomination Classic Gold and Enamel Elegance Red Hearts Charm, a stainless steel base link with 18ct Gold and enamel. Composable Nomination Classic Gold and Enamel Elegance Rhombus Diamond Black Charm, a stainless steel base link with 18ct Gold and enamel. Composable Nomination Classic Gold and Enamel Elegance Rhombus Diamond Blue Charm, a stainless steel base link with 18ct Gold and enamel. Composable Nomination Classic Gold and Enamel Elegance Rhombus Diamond Orange Black Charm, a stainless steel base link with 18ct Gold and enamel. Composable Nomination Classic Gold and Enamel Elegance Rhombus Diamond White Charm, a stainless steel base link with 18ct Gold and enamel. Composable Nomination Classic Gold and Enamel Elegance Screw Black Charm, a stainless steel base link with 18ct Gold and enamel. Composable Nomination Classic Gold and Enamel Elegance Screw Blue Charm, a stainless steel base link with 18ct Gold and enamel. Composable Nomination Classic Gold and Enamel Elegance Screw Orange Charm, a stainless steel base link with 18ct Gold and enamel. Composable Nomination Classic Gold and Enamel Elegance Screw Red Charm, a stainless steel base link with 18ct Gold and enamel. Composable Nomination Classic Gold and Enamel Elegance Screw White Charm, a stainless steel base link with 18ct Gold and enamel. Composable Nomination Classic Gold and Enamel Elegance Screws Black Charm, a stainless steel base link with 18ct Gold and enamel. Composable Nomination Classic Gold and Enamel Elegance Screws White Charm, a stainless steel base link with 18ct Gold and enamel. Composable Nomination Classic Gold and Enamel Elegance White Four Leaf Clover Charm, a stainless steel base link with 18ct Gold and enamel. Composable Nomination Classic Gold and Enamel Elegance White Grill Charm, a stainless steel base link with 18ct Gold and enamel. Composable Nomination Classic Gold and Enamel Elegance White Heart with Screws Charm, a stainless steel base link with 18ct Gold and enamel. Composable Nomination Classic Gold and Enamel Elegance White Hearts Charm, a stainless steel base link with 18ct Gold and enamel. Composable Nomination Classic Gold Elegance Black Flower Charm, a stainless steel base link with 18ct Gold and enamel. 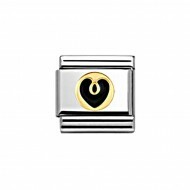 Composable Nomination Classic Gold Elegance Black Heart Charm, a stainless steel base link with 18ct Gold and enamel. 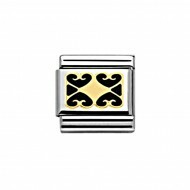 Composable Nomination Classic Gold Elegance Bow Charm, a stainless steel base link with 18ct Gold. Composable Nomination Classic Gold Elegance Double Flower Charm, a stainless steel base link with 18ct Gold and enamel. Composable Nomination Classic Gold Elegance Double Heart Charm, a stainless steel base link with 18ct Gold and enamel. Composable Nomination Classic Gold Elegance Enamel Infinite Double Heart Charm, a stainless steel base link with 18ct Gold and enamel. Composable Nomination Classic Gold Elegance Heart Charm, a stainless steel base link with 18ct Gold. Composable Nomination Classic Gold Elegance Flower Charm, a stainless steel base link with 18ct Gold. Composable Nomination Classic Gold Elegance Four Leaf Clover Charm, a stainless steel base link with 18ct Gold. Composable Nomination Classic Gold Elegance Gold Grill Charm, a stainless steel base link with 18ct Gold. Composable Nomination Classic Gold Elegance Heart Double Charm, a stainless steel base link with 18ct Gold. 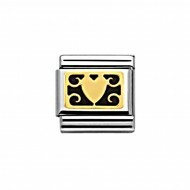 Composable Nomination Classic Gold Elegance Hearts Charm, a stainless steel base link with 18ct Gold. Composable Nomination Classic Gold Elegance Horseshoe Charm, a stainless steel base link with 18ct Gold. Composable Nomination Classic Gold Elegance Infinite Love Black Heart Charm, a stainless steel base link with 18ct Gold and enamel. Composable Nomination Classic Gold Elegance Infinite Love Red Charm, a stainless steel base link with 18ct Gold and enamel. Composable Nomination Classic Gold Elegance Infinite Love White Heart Charm, a stainless steel base link with 18ct Gold and enamel. Composable Nomination Classic Gold Elegance Interlocking Hearts Charm, a stainless steel base link with 18ct Gold. Composable Nomination Classic Gold Elegance Red Heart Charm, a stainless steel base link with 18ct Gold and enamel. Composable Nomination Classic Gold Elegance Rhombus Diamond Charm, a stainless steel base link with 18ct Gold. Composable Nomination Classic Gold Elegance Screw Charm, a stainless steel base link with 18ct Gold. Composable Nomination Classic Gold Elegance White White Flower Charm, a stainless steel base link with 18ct Gold and enamel. Composable Nomination Classic Gold Elegance White Heart Charm, a stainless steel base link with 18ct Gold and enamel. Composable Nomination Classic Gold Enamel Elegance Infinite Double White Heart Charm, a stainless steel base link with 18ct Gold and enamel. Composable Nomination Classic Gold Enamel Elegance Infinite White Charm, a stainless steel base link with 18ct Gold and enamel. Composable Nomination Classic Gold Enamel Elegance Infinite White Four Leaf Clover Charm, a stainless steel base link with 18ct Gold and enamel. Composable Nomination Classic Gold, Enamel and Pearl Elegance Black Flower with Pearl Charm, a stainless steel base link with 18ct Gold and enamel. Composable Nomination Classic Gold, Enamel and Pearl Elegance Black Hearts with Pearl Charm, a stainless steel base link with 18ct Gold and enamel. 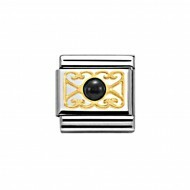 Composable Nomination Classic Gold, Enamel and Pearl Elegance Black Pearl Charm, a stainless steel base link with 18ct Gold and enamel. 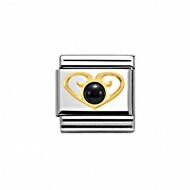 Composable Nomination Classic Gold, Enamel and Pearl Elegance Heart with Black Agate Charm, a stainless steel base link with 18ct Gold and enamel. Composable Nomination Classic Gold, Enamel and Pearl Elegance Heart with Pearl Charm, a stainless steel base link with 18ct Gold and enamel. Composable Nomination Classic Gold, Enamel and Pearl Elegance Hearts with Pearl Charm, a stainless steel base link with 18ct Gold and enamel. Composable Nomination Classic Gold, Enamel and Pearl Elegance Pearl Red Enamel Charm, a stainless steel base link with 18ct Gold and enamel. Composable Nomination Classic Gold, Enamel and Pearl Elegance Red Flower with Pearl Charm, a stainless steel base link with 18ct Gold and enamel. 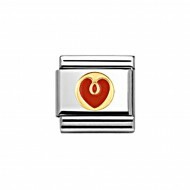 Composable Nomination Classic Gold, Enamel and Pearl Elegance Red Hearts with Pearl Charm, a stainless steel base link with 18ct Gold and enamel. Composable Nomination Classic Gold, Enamel and Pearl Elegance White Flower with Pearl Charm, a stainless steel base link with 18ct Gold and enamel. Composable Nomination Classic Gold, Enamel and Pearl Elegance White Hearts with Pearl Charm, a stainless steel base link with 18ct Gold and enamel. Composable Nomination Classic Gold, Enamel and Pearl Elegance White Pearl Charm, a stainless steel base link with 18ct Gold and enamel. Composable Nomination Classic Gold, Enamel and Pearl Elegance Black Agate Black Enamel Charm, a stainless steel base link with 18ct Gold and enamel. Composable Nomination Classic Gold, Enamel and Pearl Elegance Black CZ Cubic Zirconia Black Enamel Charm, a stainless steel base link with 18ct Gold and enamel. Composable Nomination Classic Gold, Enamel and Pearl Elegance Red CZ Cubic Zirconia Red Enamel Charm, a stainless steel base link with 18ct Gold and enamel. Composable Nomination Classic Gold, Enamel Elegance White Opal Charm, a stainless steel base link with 18ct Gold and enamel.